Between 35,000 in the first weeks of October https://nypost.com/2018/11/23/thousands-of-nycha-residents-didnt-have-heat-hot-water-on-thanksgiving/ … And 25,000 in the week leading up to Thanksgiving https://nypost.com/2018/11/23/thousands-of-nycha-residents-didnt-have-heat-hot-water-on-thanksgiving/ … Approximately 60,000 New Yorkers have already suffered without heat this winter in public housing alone. What a disgrace. This week, as we celebrate Thanksgiving, we're spending time reflecting on a few of the things we're most grateful for at Heat Seek. Today we're incredibly grateful for the developers, data scientists, advocates, and activists who make up the housing data community in NYC. This collective of folks who care deeply about housing equity meets once a month after work to propose ideas, talk through issues with the data, and share the individual projects we're all working on. There's so much we can learn when we look at trends in housing data. From the loss of rent stabilized units over time, to the number of housing maintenance complaints and violations in a building, to the deeds and sales records of properties (and the banks that issue loans to them), we can learn a great deal about what's happening in NYC real estate by looking at the data. As we continue to learn, we can better hold accountable the predatory landlords and bad actors who are skirting the laws and displacing low income tenants across our city. The Worst Landlord's Watchlist, published each year by the Public Advocate, is an important start, but there's so much more we can do. By bringing together domain experts -- the tenant organizers, housing lawyers, and affordable housing advocates who work directly with tenants -- and data wizards (that's a technical term, right? ), we're able to add a data driven element to the conversation, in order to bolster the qualitative stories that tenants share. We're so grateful for this group of individuals. We're grateful to work with you, to learn from you, and to contribute to the conversation. Thank you and Happy Thanksgiving everyone! Today we're grateful to everyone who has ever contributed their time to Heat Seek - and we mean everyone. From our board of directors, to our trusted advisors, to anyone who has ever volunteered (even for a day) for Heat Seek, we appreciate all of you more than you know. To the entire Heat Seek community, thank you! This week, in preparation for Thanksgiving, we're spending time reflecting on a few of the things we're most grateful for at Heat Seek. Today we're especially grateful for Blue Ridge Labs @ Robin Hood, a tech incubator + fellowship program aimed at helping entrepreneurs build technology to fight poverty in New York City. Its also the labs arm of the Robin Hood Foundation, an incredible anti-poverty foundation in NYC. We first got involved with Blue Ridge when we participated in their inaugural Catalyst incubator in 2015. When we found out we'd been accepted, it had been almost a year since we won the 2014 BigApps competition. We'd spent the year continuing to work on Heat Seek in an all-volunteer capacity, while also working toward incorporating as a nonprofit and applying for our federal 501(c)(3) tax exempt status. We'd done so much as volunteers that year. Traveling to far flung neighborhoods in the Bronx and Brooklyn at night and on the weekends, calling lawyers, organizers, and tenants in between grad school classes and on lunch breaks at work. We even met as a team every Sunday for an entire year to build out the hardware, plan installs, and troubleshoot bugs in the app. By the end of it we were exhausted, but we'd proved (to ourselves at least) that our sensors worked in the field, that our data was accurate, and that there was a demonstrated need for our work. Now we had to prove it to the rest of the world - or at least New York City. Besides the funding that came with Catalyst, which let my co-founder William and I work on Heat Seek full-time (a HUGE milestone), the team at Blue Ridge Labs helped us develop our initial plan for achieving impact. We'd learned very early on the merely having a sensor wasn't enough to get someone's heat restored, and that the bread and butter of our work had to be helping people use their data to compel change. Now we had to figure out how to do that, which meant learning a lot about NYC's arcane rent laws, the byzantine housing court process, and the network of housing lawyers and organizers who help New Yorkers navigate the bureaucracy in order to save their homes. The team at Blue Ridge Labs helped us shift our thinking from building a product to running a program, and they're responsible for a large part of the impact we've achieved. But these aren't the only reasons we're grateful for Blue Ridge Labs. What's so special about Blue Ridge is how they've cultivated a community of folks who are all passionate about improving the lives of low-income New Yorkers, and believe that technology has a role to play in accelerating change. They are the only co-working space for tech startups in NYC (that I know of) where everyone is focused on impact, not profit. At Heat Seek, we're inspired every day by the passion and commitment of the teams that come through Blue Ridge. It can sometimes be hard to explain to people why we're a nonprofit, why we go through all the trouble of applying for grants and working with community organizations when we have a product we could just sell. Some days we wonder if it wouldn't be easier to just sell the sensors and let the free market take care of the rest. But we know that inadequate heat disproportionately impacts low-income New Yorkers, and if we sold the sensors, they'd be unlikely to benefit. When our resolve gets shaky, we draw on the support of the Blue Ridge community and remember that we're not the only ones who believe technology should be a force for good in the world. We remember that at the end of the day, it's our mission that matters. When we graduated from our most recent incubator and didn't have a place to work, Blue Ridge Labs welcomed us back with open arms and open desks. And, when someone who we thought had our best interest in mind and whose opinion mattered very much to us, told us she believed we were failing in our mission because the city hadn't purchased our technology yet and we should just shut Heat Seek down, they were the first to tell us not to listen, that systemic change takes time, especially in a real estate environment as highly political as New York City's, and that even though we weren't "ready to scale," our work certainly mattered to the 40 families we helped get heat last winter. It's hard to explain exactly why the team at Blue Ridge means so much to us, but I'll leave you with this. At our office Thanksgiving on Monday, we went around the table listing the things we were most thankful for. Halfway through we had to institute a new rule: it had to be something other than Blue Ridge. Today we're grateful for the people and organizations whose funding keeps us going. We're highlighting two foundations whose support has meant the world to us recently. Redundant. Internet goes out? No problem - we'll write all the data to an SD card on the device. Once the internet comes back, we'll seamlessly send all your data to your account. Reliable. They're based on the Adafruit Feather, a commercial grade, tested board with tons of documentation online. If you don't know Adafruit, check them out! The company is female founded and based in NYC. So much easier to install. No more 'will it or wont it connect'. No more hacky USB modem. A real IoT device designed for consistency and reliability. Plug it in, attach it to the wall, and you're good to go. Fragile. They were always going offline for unknown reasons, meaning we'd have to send someone to fix or replace them. This took up so much staff time. Custom. Which sounds cool, until they stop working and no one knows how to fix them, and there's no documentation online to help you figure it out. Complicated to install. The two devices (the hub and cell) had to connect to each other and to the internet, meaning there were multiple points of failure. Devices in different apartments had to connect to each other for the whole system to work. Don't get us wrong, our old sensors got the job done. And they were absolutely critical in helping us demonstrate the potential of technology to document insufficient heat. But these new sensors are going to take our work to a whole new level, and we can't wait to get them all installed this season. Next is The New York Community Trust. This foundation is especially dear to us because they were the first foundation to write us a grant after we graduated from our incubator in August. Toward the end of the summer, it wasn't actually clear that we were going to be able to sustain another winter season. We had amazing new sensors and three years of strong partnerships with the housing justice community in NYC under our belts, but not a lot of funding to keep the lights on. People like to talk a big game about innovation, but when it comes down to it, its a lot of trial and error, learning from the community, and testing new things that have never been done before. It can be hard to fundraise for that. And while innovation is exciting and new and has the potential to move the ball forward on really sticky, hard to solve problems, it can be riskier than a tried and true solution. Knowing that we had a vote of confidence from the Trust let us to redouble our own commitment to the work. At Heat Seek, we are committed to ensuring that all New Yorkers, regardless of income, have the tools they need to obtain the safe, healthy housing they are entitled to. And we're so grateful that NYCT shares our vision. Did you know that Heat Seek's first round of sensors were entirely designed and built by volunteers? Back when we won BigApps in 2014, we had one working prototype and it looked like this ↓ ! Lucky for us, we have some of the best volunteers in the world. They're incredibly talented hardware engineers, software developers, and designers, and they helped us build the custom Heat Seek sensors we've been using ever since. But after three winters in the field, a significant number of our sensors are broken or worn out. It's time for Heat Seek to level up, with a new sensor design that's more reliable, more precise, and less expensive to install. We're moving away from our original mesh network design - radio signals don't travel well through dense concrete and metal rebar, making our whole system fragile - and instead planning for each sensor to have its own onboard internet connection. To increase versatility and reduce cost, our new sensors will be able to connect to WiFi, cellular internet, or even LoRaWAN, depending on the situation. This means we can maximize connectivity options and do installs in the coldest apartments in a building, regardless of the building's layout. The new sensor will have a more precise thermometer (+/- .5° C) and a humidity sensor to calculate the heat index, for future summer use. These new sensors will be more reliable, significantly easier to install, quicker to manufacture, and ultimately provide our clients with better data. This is a large part of why we need your support now. 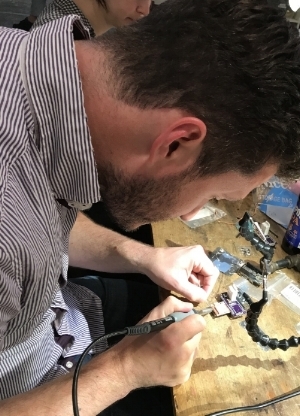 It's not often that a nonprofit designs a hardware product, an expensive, time-consuming process that requires highly-skilled labor. If we could purchase an off-the-shelf sensor that meets our clients' needs, we certainly would. But so far, there isn't a cheaper alternative to the custom temperature sensors we're building. In order for our new sensors to be ready for fall, we need to start the manufacturing process now. Will you help us keep more neighbors warm? Years of Organizing = a Warm Winter! Loraine wasn’t going to stop until she and her neighbors got what was right. Thankfully, now they can stop, because with Heat Seek's help, they won! It’s not a story we hear all the time: of tenants forming a coalition strong enough to beat the landlord at every turn, securing that which should have been theirs all along: a safe home for their families. Often, there are just too many pitfalls: the landlord wins in Housing Court, tenants get intimated by the landlord’s actions, the city declares the building uninhabitable, and more. Thankfully, for Loraine and her neighbors in a small building in the heart of Flatbush, they combined lots of diligent work with skilled support, fearless grit, and a little luck. Heat Seek began working in Loraine’s building last winter, when the temperatures were some of our coldest in the city: entire days in the low 60s, with the only heat coming when the city inspector showed up. After the season, we wondered why our organizing partners hadn’t initiated a group case in Housing Court or tried another landlord strategy. This season, though, we learned that sometimes the win comes a little later than we had hoped--and with a more enduring effect. “This winter, I’d call the super to let him know our heat was low, and he’d immediately turn it on,” Loraine told Heat Seek. This was the same super who, in previous years, had refused to provide service to Loraine and the other long-time tenants, insisting that they call the management company instead. To what was this change attributed? It’s a powerful testimony to Heat Seek’s impact for some tenants, recognizing that not all landlords are deterred by this monitoring and not all tenants want their landlord to know they have a sensor. Many landlords can abuse and harass tenants so effectively because it often takes place in the shadows: confrontations at a tenant’s door, cold temperatures except when the inspector visits, lengthy construction times meant to make life miserable for the building’s longtime residents. Thankfully, Heat Seek’s sensors are able to monitor landlord behavior, in real time and around the clock. But the heat in Loraine’s building is also a testament to the ongoing work of the building’s tenant association and the support of their organizers at Flatbush Tenant Coalition. These tenants have endured the worst of landlord tactics aimed to drive out these long-time, rent-regulated tenants and bring in market-rate tenants. After an ownership change twelve years ago, the building started to deteriorate. “You could see the basement through the holes in my floor,” Loraine says, reporting persistent leaks and pervasive mold, damaged stairs, and a front door with no lock. After Loraine and her neighbors discovered that everyone was living in horrible conditions, they resolved to take action to get what they deserved. Letters to the landlord proved ineffective, so they escalated their efforts and showed up in front of the landlord’s mansion in a gated community, where the neighbors didn’t take kindly to this public shaming. Even after the repairs were made, however, the landlord made it clear not only that they didn’t want these tenants living there--but they sought to prevent any future tenants “like them” from renting apartments. “The landlord told a group of us one night that they didn’t want any Black people or people with children to rent there anymore,” Loraine tells Heat Seek. “They were trying to intimate us, so we fought back.” The tenants sought out the assistance of the Fair Housing Justice Center, which deployed testers to apply to an open rental in the building. The white and Asian applicants were approved; the Black and Latinx folks denied, which resulted in fines over $200,000. Despite these illegal rental practices, tenant harassment, and willful neglect, the landlord continues to buy up properties in Flatbush, a neighborhood that is rapidly gentrifying. Living in the neighborhood that Loraine and her husband love so much, with family and friends from their home countries of Grenada and Trinidad, is becoming prohibitively expensive, especially as more rent-regulated units are converted to market rate. We do, too, Loraine. We do, too. To support our work with tenants like Loraine, click here. “Every time they came to fix it, they just touched the radiator and said everything was fine,” Sandra said of the maintenance workers in her building. While she’s lived in Harlem for many years, this was her first winter in this building, and it was COLD. “I called to report the problem, and they wouldn’t do anything about it. I know it’s a building-wide issue that many of my neighbors struggle with,” but Sandra refused to let us. Since this was the main problem in her apartment--no other significant repairs to be made--she hadn’t yet engaged an attorney or community organizer. So, “I reached out to Heat Seek in the midst of my misery”, through a request form on our website. Because we had some extra hardware in February, we were able to install sensors for several tenants from our waitlist who lived in buildings that fit our criteria: bad landlords in gentrifying neighborhoods who are trying to drive out rent-regulated tenants. “There’s a concerted effort to get lifelong Harlem residents out of the building, raise the rents, and bring in people of higher incomes,” Sandra reported to Heat Seek. After a few weeks with a Heat Seek sensor, we confirmed that her temperatures were consistently below the legal limit, and Sandra wanted to take action. She knew that the city inspection system wouldn’t fix her problem quick enough, so she hand-delivered a demand letter to the landlord, which Heat Seek provided to her along with her heat log. Her landlord was taken aback--by both Sandra’s persistence and Heat Seek’s sensor--so the chiefs of management and maintenance met with her. “This can’t be right,” they complained, upon first examining her heat log. “I know it’s right,” Sandra replied, confident in her data. Convinced by Heat Seek’s third-party testimony, the management agreed to send another maintenance person again. We hear stories like this from many of our tenants: our third-party heat logs provide them much-needed tools in their struggle for sufficient heat. Our work can prevent them from the miserable process of Housing Court, by proving both the tenant's will and the severity of their temperatures. Sometimes, Heat Seek is enough to convince some landlords to do the right thing and turn up the heat. Struggling under the abuse of their notorious landlord, a group of Upper West Side tenants and their organizer reached out to Heat Seek for help. The landlord was trying to eject them from their affordable homes--some who had lived there for four decades--so he was withholding heat. The tenants recently had some luck getting basic repairs made and were hopeful the landlord would respond to Heat Seek data that proved how cold they were. Thankfully, they were right. After the Heat Seek sensors had been installed for a few weeks, Heat Seek sent the landlord a certified letter, including the tenant's heat log, requesting that he obey the law and turn up the heat so tenants wouldn't have to endure indoor temperatures in the low 60s. Two days later, the landlord called Heat Seek, surprised to hear about the tenants' temperatures and scared of getting caught. The landlord promised to make needed radiator repairs in each apartment, just like that! Landlords don’t always reply to our letters, and they don’t usually promise to turn up the heat in a short phone call. But when they do, we’re certainly glad that our work can help tenants get warmer quicker and stay warmer longer. When our sensors and data can force landlords to change their behavior without going to Housing Court, everybody wins. After many months of appearances to court, Linda Smith finally won! While Housing Court does not offer "damages" to tenants, Linda secured two months of rent abatement [free rent]--on top of the two months she got earlier this winter. Her attorney also succeeded in compelling the city to punish the landlord with a $128,000 fine for his willful negligence of her building. Her attorney employed Heat Seek data to demonstrate that the landlord had failed to comply with the previous ruling, where he promised to provide legal amounts of heat. Heat Seek is proud to support tenants like Linda, and we're so glad she continues to win better conditions for herself and her neighbors! The temperature data coming from 178 Rockaway Parkway in Brownsville couldn't paint a clearer picture of a landlord manipulating the heat. Heat Seek installed temperature sensors in the building in October in partnership with The Legal Aid Society, and in the weeks that followed, they recorded hundreds of hours in which the temperature was below the legal limit according to NYC Housing Code. Despite a long, warm fall, nearly 25% of the hours were in violation. Last week, Heat Seek held a press conference in front of the building to announce a partnership with Brooklyn Borough President Eric Adams and The Legal Aid Society. The same day, Legal Aid Society attorneys filed a case against the landlord in NYC Housing Court. The heat came on! After weeks in which the temperature hovered at or around 60 degrees, the temperature increased almost a full 10 degrees the day after the press conference. At Heat Seek, we're thrilled with this outcome. We'll continue to monitor the building to ensure that the heat stays on. But for now, the tenants at 178 Rockaway Parkway can rest easy, knowing we're keeping a watchful eye on their data. Shout out to our amazing volunteer Andrea Katz for making our beautiful map! Last week we announced our partnership with Borough President Eric Adams, The Legal Aid Society, St. Nicks Alliance, and Brooklyn Legal Services Corporation A. As BP President Eric Adams stated: "I am proud to work with the innovative team at Heat Seek NYC, our incredible legal advocates, as well as courageous tenants throughout the borough that are standing up for their housing rights." With Heat Seek sensors, we are empowering Brooklyn tenants as they face bad-acting landlords denying them heat. We also look forward to "using cool technology to warm the homes of Brooklynites, while putting bad-acting landlords on the hot seat for their harassing behavior." BROOKLYN, NY, December 1, 2016: Today, Brooklyn Borough President Eric L. Adams joined impacted tenants and housing lawyers in announcing a lawsuit based on data from an expanding technology partnership to monitor heating-related harassment in Brooklyn apartment buildings. Standing outside 178 Rockaway Parkway in Brownsville, a property that has had numerous heat complaints through 311, they discussed how residents across the borough are utilizing sensors from Heat Seek NYC, the winner of the NYC BigApps 2014 contest, to remotely track the temperature in their homes during the winter months. Their technology, using sensor hardware and web applications, helps ensure that heat levels in apartments fall within the legal range, while providing data-based evidence to verify heating code abuse claims in housing court. Borough President Adams first forged connections back in 2014 between this locally-based non-profit and a number of properties managed by good-acting landlords such as Fifth Avenue Committee, who agreed to use the technology on a proactive monitoring basis. Now, as part of his larger focus on combating tenant harassment, he detailed $5,000 in new funding his office has allocated to build additional monitoring hardware at five buildings across the borough, including 178 Rockaway Parkway. Underscoring the imperative for addressing this issue, Borough President Adams presented 311 data that highlighted problem neighborhoods for residential heating complaints citywide, which correspond heavily with areas of economic hardship and gentrification. Between October 2015 and May 2016, the Brooklyn ZIP code with the highest number of complaints was 11226, covering Ditmas Park and Flatbush; other ZIP codes that experienced a high number of heating issues, per the data, included 11207, 11208, 11210, 11212, 11213, 11216, 11221, 11225, 11233, and 11238. The buildings selected for the expansion of this partnership were chosen through a combination of variables, including the number of 311 complaints, community input to identify bad actors, and looking at the next 200 landlords who are not currently enrolled in the New York City Department of Housing Preservation and Development (HPD)’s Alternative Enforcement Program (AEP). Borough President Adams explained that he is only identifying 178 Rockaway Parkway as a recipient in order to put all landlords in the borough “on notice.” According to Heat Seek NYC, 178 Rockaway Parkway had at least seven heating complaints in the last 96 hours, as well as more than 100 heating complaints during the 2014-15 winter. The sensors that have been deployed in the building for several weeks have reflected a variety of temperature readings below the legal minimum. Borough President Adams also outlined legislative action he will be working on with the City Council, in particular Council Member Ritchie Torres, that would allow for the installation of heat sensors in apartment buildings, as well as for their utilization as a means to combat heating-related abuse by bad-acting landlords. Additionally, Borough President Adams announced a training partnership between New York City Housing Court and Heat Seek NYC that will train housing court judges on how to interpret data collected by heat monitors. Last year, Borough President Adams held a series of tenant harassment hearings in Downtown Brooklyn, East Flatbush, and Williamsburg. Nearly 150 unique testimonies were gathered, and his office was able to resolve roughly 50 percent of the cases by connecting them to needed services and legal representation. A number of the individuals who testified as witnesses about the housing problems they faced met with Brooklyn Legal Services Corporation A (Brooklyn A) and civil rights attorney Norman Siegel, who conducted comprehensive intakes with each tenant. These tenants were counseled on a wide variety of issues related to discrimination, harassment, and mistreatment, including illegal rent increases, faulty or lack of repairs, and deprivation of services. Additionally, Brooklyn A has undertaken the representation of groups of tenants who testified, particularly those experiencing building-wide problems of harassment and discrimination. Other cases are under careful review for potential to bring comprehensive housing litigation. Spring is here, and as the weather gets warmer, we’re able to take a step back and reflect on this winter’s pilot program. It went exceedingly well! I thought I’d share a bit about how the program ran, how many folks we served, and what we accomplished this winter. As many of you know, Heat Seek helps tenants resolve their home heating issues by providing the objective, reliable temperature data they need to hold their landlords accountable. We do this by installing low cost, web connected temperature sensors in buildings across New York City. For the winter 2015 pilot program, we sought out buildings with the following criteria: (1) an organized tenant association, (2) at a high risk for continued landlord abuse, as identified by our partners, and (3) stated willingness to bring a group case to housing court. Heat Seek staff and volunteers install the temperature sensors at the beginning of heat season (Oct 1 - May 31), and they remain in place throughout the winter. The temperature sensors monitor the temperature by taking a reading once per hour. Readings are transmitted via 3G internet to our web app, where they are recorded in the tenant’s account. The web app incorporates the outdoor temperature, the time of day, and time of year in order to identify whether or not a building is in violation of NYC housing code. Tenants and their advocates can access our web app at any time to view their readings and can download heat logs for use in tenant-landlord negotiations and/or housing court. During the winter of 2016, Heat Seek ran a pilot program in 56 buildings throughout four boroughs. Heat Seek data help clients achieve more favorable legal outcomes. In three separate cases that spanned different attorneys and at least eight buildings, landlords made more concessions to their tenants and our clients. Landlords restore or increase heat provision when they know Heat Seek sensors have been deployed in their buildings. In four buildings, tenants shared Heat Seek data directly with their landlords, who shortly thereafter turned up the heat. These increases in heat are reflected in our data. To view the neighborhoods where Heat Seek was active this winter, be sure to check out our Pilot Map! It’s been a while, but we’re back! I know, I know. We’ve been conspicuously absent from this blog for a while. In truth, we’ve been so busy running all over the city installing Heat Seek sensors, connecting with lawyers, attending tenant association meetings, and supporting folks in housing court that we haven’t had much time to share our progress with anyone outside our core team. But today’s the day we’re changing all that. Get ready! We’re in 50 buildings this winter (a HUGE increase from 6 last winter). William made a great map of all the buildings we’re in by City Council district, which you can check out here. 10 of the buildings we’re in are NYCHA buildings. Did you know that NYCHA is the largest public housing authority in North America? Between 400,000 and 600,000 people live in NYCHA housing, but it’s been allowed to fall into disrepair and currently has a $16 billion capital backlog. We have 10 cases with lawyers in housing court. As many of you know, this represents a very important goal for us this winter as we explore the variety of ways tenants use our data to get better outcomes in court. Speaking of lawyers, we’ve grown our legal partners to include Legal Aid, Legal Services NYC, Brooklyn Legal Services Corp A, UJC, and MFY. We’ve also grown our network of community partners to include CASA, Crown Heights Tenant Union, Flatbush Tenant Coalition, Pratt Area Community Council, Tenants and Neighbors, and UHAB. Our legal & community partners represent our pipeline - they tell us which buildings are good candidates for Heat Seek sensors. By growing our partner network, we’re able to help more New Yorkers in need. We’re spending the spring compiling success stories. We’re interviewing our tenants, community partners, and lawyers to get a sense of how they used our data this winter to get their heat restored. We’ll be compiling and sharing that soon! In February, we also started our time at Beespace. Its a fantastic incubator with a ton of great supports (both financial and programmatic), and soon we’ll be working from there full time. We hold a weekly meetup there on Wednesdays from 6pm-8pm that’s open to the public - feel free to join us!